In about the same time as reading the palace of illusions, I also read another collection of feminist short stories. This time it was a pleasantly brilliant one. 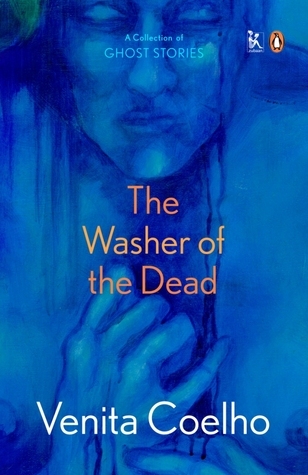 A friend introduced me to this book titled ‘The Washer of the Dead’ by Venita Coelho (VC). (Look up Venita Coelho if you haven’t heard of her, she seems to have a very jealousy-inducing life). The Washer of the Dead is a collection of ghost stories – yes, there is a ghost in every story – just not the type we’ve been used to seeing. There is a ghost that is in love, one that rides the wind, one that speaks to a woman during her period – several of them who live their lives right outside the spectrum of our imagination. Every one of the short stories is that of a woman – urban, rural, mad, musician, drug addict, dalit – you have all kinds. I could talk at length about every short story and how beautifully Venita Coelho weaves real life tragedies into ghost stories. But I’ll pick only a few of my favourites here as examples. My best from the book is a story called ‘The Naked Ghost’ – about a woman who is humiliated, stripped naked and murdered for drawing water from the village well. The shortest of all stories in the book, this shocks the last bone of our comfortable urban sensibilities. Struggles that dalit, poor, rural, women go through in no more than a few words. VC draws a picture of a naked woman crying for justice in front of your eyes. It breaks my heart to think this is the world I live in. The last story in the book is called ‘sealed’ – one of a ten year old dark virgin girl who was allegedly sold by her mother for three thousand rupees into prostitution. She dies in a cupboard and escapes to her dream world in death. The story titled washer of the dead is that of honour killing – a little girl brutally killed by own brother – her dead body tells her story to its washer. The ghost next door, about a little girl in whose skirt a ghost puts its hands every day, kills you with the child’s ignorance and tragedy. VC takes you through stories of women around you – women in real life who are surrounded by ghosts haunting them that they can do nothing about. She makes dowry, sexual abuse, domestic violence, prostitution, suicide, religion, caste – everything into ghosts that trouble women. In The Washer of the Dead, Venita Coelho narrates ghost stories – terribly scary ones. The ones that scare you about the real world that have no ghosts.